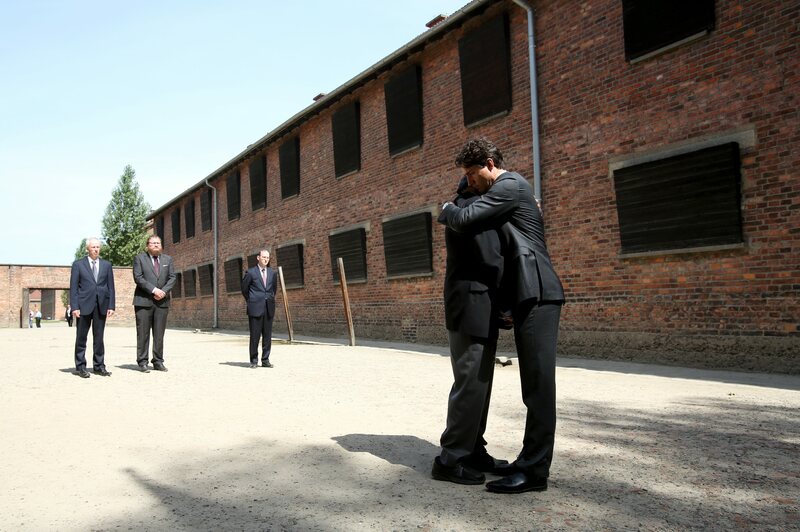 Oświęcim, Poland - An emotional Justin Trudeau used a tour to Auschwitz-Birkenau, the scene of one of the worst chapters in human history, to warn against intolerance and offer a message of love. The blue skies and sunshine on Sunday were a sharp contrast to the history of the place as the prime minister walked past barbed wire fences and surveyed the gas chambers where more than one million people, mostly Jews, were killed in the Second World War. Trudeau was stone-faced through most of the visit as he was escorted by one of the camp’s survivors, 88-year-old Nate Leipciger, now of Toronto. But the prime minister couldn’t hold back the tears as he stood before the ruined gas chamber where Leipciger’s mother and sister were killed 70 years ago. The prime minister didn’t say much during the nearly three hours he spent walking through the camp. But he did leave a message in a guest book kept by the Auschwitz-Birkenau State Museum. 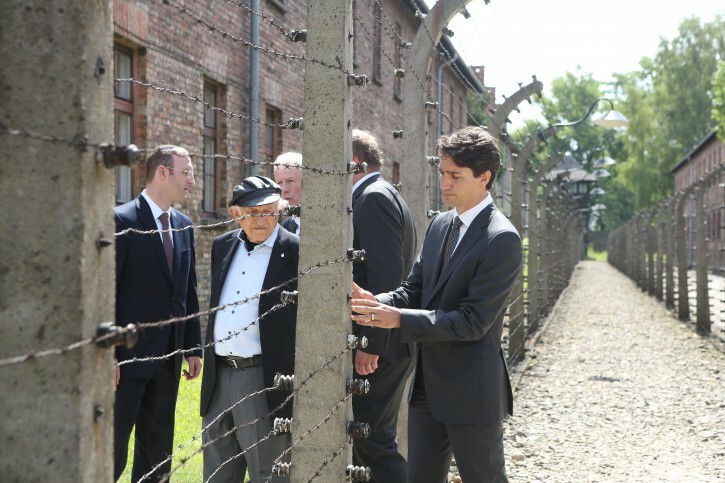 Trudeau is the third sitting prime minister to visit Auschwitz-Birkenau, after Jean Chretien and Stephen Harper. The stop came between this weekend’s NATO summit in nearby Warsaw and a trip to Ukraine, where Trudeau will spend the next few days. Trudeau remained stoic through most of the visit as Leipciger recalled his experience at the camp, where he arrived in 1943 as a teenager. One stop was in a darkened room where a mound of hair was on display: locks from women and girls killed by the Nazis. Trudeau was visibly affected on several occasions. 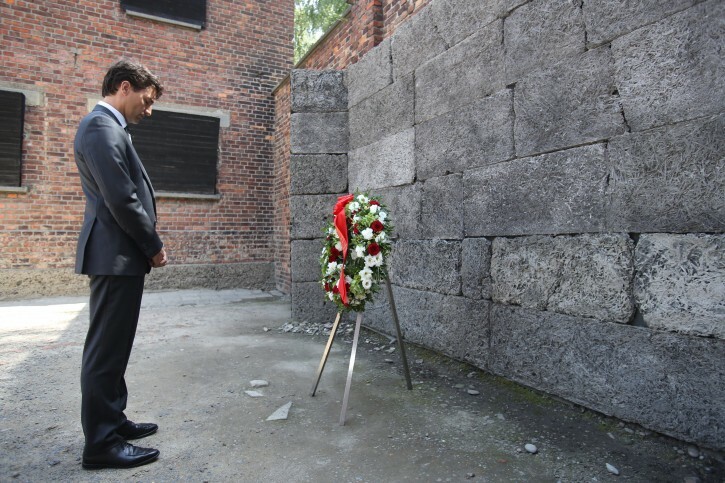 At one point, he laid a wreath on behalf of Canada at a wall where the Nazis shot hundreds of prisoners. After pausing for a moment of silence, he went to shake Leipciger’s hand but instead ended up hugging him before Leipciger kissed him on the cheek. The prime minister also looked shaken as he walked through an intact gas chamber, which still bore fingernail marks on the cement walls where desperate prisoners tried to escape before they died. But it was while standing before the gas chamber where Leipciger’s mother and sister were killed, as Rabbi Adam Scheier from Montreal prayed, that Trudeau was forced to pull out tissue and wipe away tears. He also shared a few personal words with Leipciger and Scheier. Foreign Affairs Minister Stephane Dion and International Trade Minister Chrystia Freeland accompanied the prime minister. David J. Cape, chair of the Centre for Israel and Jewish Affairs, said Trudeau showed “great sensitivity’’ during his visit. “As Canadians, we must do more than remember — we must continue to care for the Holocaust survivors among us, speak out against antisemitism and hatred in all of its forms, and call for effective action to prevent genocide in our own time,’’ he said in a statement.